Oh, I definitely need to do this! My closet is in horrible disarray right now, I'm sure I could stand to sort out what I don't need then replenish-always the best part :) I love that J. Crew cardigan! I really need to inventory my clothing! And I always feel like I am in need of good, staple pieces. These are all such stylish and classic choices, you just can go wrong. I'm all about the basics...hmm...maybe a little too much because it seems like all I wear! love this. i just got a black pair of boots to add to my collection from banana, but i love these too. basics are classics! 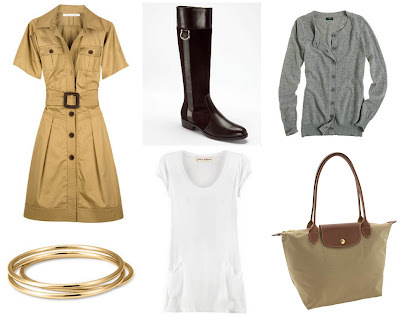 loving the riding styled boots & i'm a huge fan of those longchamp bags! oh and that day dress is so chic and classy! I just cleaned out my closet last night. So this post couldn't have better timing. Now I've just got to get out there and get shopping! This year I swear I'm going to have a gameplan in mind...otherwise I'll end up with a closetfull of zip-up hoodies. those bangles are really lovely--I'm seriously lacking in the everyday jewelry department. and you can't beat a longchamp bag for versatility and class. great picks blair! I just went through my closet over the holidays and organized and cleaned out all that I did not need. Now I can find items to wear! Better than being basics, they are classics so they'll always work. Great selection! this is a great round up of basics...all totally spot on. i got a longchamp overnight tote at the duty free on my way home from Mexico last year and i love it!